We had a great time at our cooking class this past weekend. More than a dozen CSA members met in the home of Terry and John Burke this past Saturday, to learn about the wonders and fun of fermented food from Shane Brill. Class participants learned how to prepare a host of fermented foods and were able to take samples ad supplies home with them to fuel their new inspiration for fermenting. We all had a lot of fun as we cooked and ate together, sharing knowledge and community over the food products of organisms we often take for granted: microscopic organisms like bacteria and yeast. The class helped me to better appreciate the vast microscopic communities of organisms around us. A seemingly whole other world, where vast colonies of alien looking creatures live out their lives; creatures that we live with symbiotically every day through our food. Many people have heard of the bacteria in our digestive systems that help us to process the food we eat, but people have also been working with bacteria and other microscopic organisms to make/prepare food since before recorded history. Though they may not have appreciated that they were making a deal with invisible organisms to digest, prepare and preserve foods in exchange for steady meals, our distant ancestors reaped the benefits of bacteria and yeasts, same as we do today. In fact, many of the processes Shane taught about in the class had very old origins in the cultures they arose from. Kefir comes from the northern Caucasus Mountains, Kimchi from Korea, pickling from India and sauerkraut from Germany (although the process is thought to have been introduced to Europeans by Genghis Khan after he invaded China). Needless to say, the class was a big success! Hopefully all those who participated are inspired to continue their own experiments in fermenting foods. One thing we learned is that the limits of what and how you can ferment foods (farm veggies included) seems to only be limited to your supplies and imagination. For all of those who missed out on the fun, don’t worry, we hope to offer more classes on fermenting in the future. Stay tuned! In the meantime check out more exciting cooking class opportunities with us over the next couple months, featuring locals chefs like Sabrina Sexton and Glenn May! Summer is a beautiful time to be on the farm. The fields are teeming with life, in all shapes and sizes, and the world around you feels alive; you can hear it in the call of birds and the buzz of insects, and you can smell it in the hot air. Baby swallows sit atop trellis posts, waiting for their parents to bring them meals from the field. Gusts of wind blow countless specks of corn pollen from one stalk to another, a clever pollination trick. Dozens of species of plants (planted and wild) flash colorful flowers to advertise their wares; a giant bazaar of vendors shouting out with colors, shapes and pheromones. There is no better time to see the farm in action than during summer. The fields are in full production, and the edible bounty of the planet is ripe for the picking. A meal cooked with the diversity of veggies we are harvesting right now will have you working in every color of the rainbow! The farm right now is a busy place, filled 24/7 with the endless interactions of organisms with each other and their environment. It feels rejuvenating when you’ve had time to go out into nature and feel a little closer to the environment around you, to see and be reminded of how you are connected to the land you live off. Our farms mission statement explains that we strive to strengthen the relationship between community members, their farmers, their food and the land. Our endeavor is always to be a place from which you can find knowledge, comfort, wonder and fun as you connect with the natural world; indeed, we would agree with the Japanese farmer/philosopher Masanobu Fukuoka when he said that “the ultimate goal of farming is not the growing of crops, but the cultivation and perfection of human beings.” What better way can we offer to serve you than to invite you out to the farm? Talk to us about coming to volunteer some time out in the fields. Whether you can stay with us for a day or a couple hours, we’d love to have your help and to show you how your food grows. Whether you make it a regular thing, or a single experience I urge you to find the time to come out and connect with the earth, through your food. Take time with us to get a fresh perspective of the world around you, or to rejuvenate from a hectic schedule. We’re here all day, everyday, and we’d love to see you! 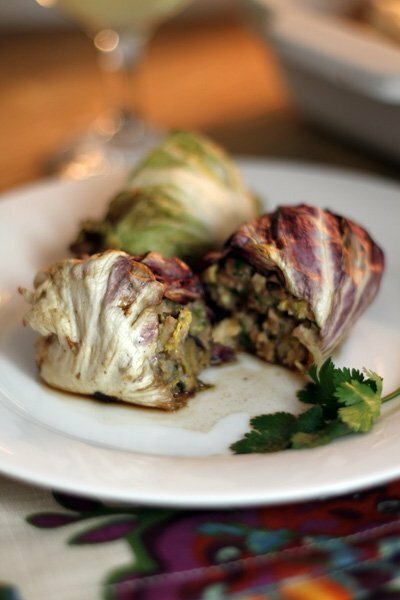 Several people at markets and CSA pick-ups expressed that they need new ideas for what to do with the cabbage we have in season right now. Well ask and you shall receive! I’ve compiled four different recipes here to give you some ideas about what you can do with this delectable veggie, besides coleslaw of course. The first two recipes contain meat, while the second two do not and could be used for vegetarian dishes. All four recipes come from the website http://www.thekitchn.com/. Having tried all four recipes at this point, I will personally attest to their deliciousness. I also found that they are easy recipes to mess around with when you like (for instance substituting one meat for another or choosing different herbs to change the spiced flavor of the dish). 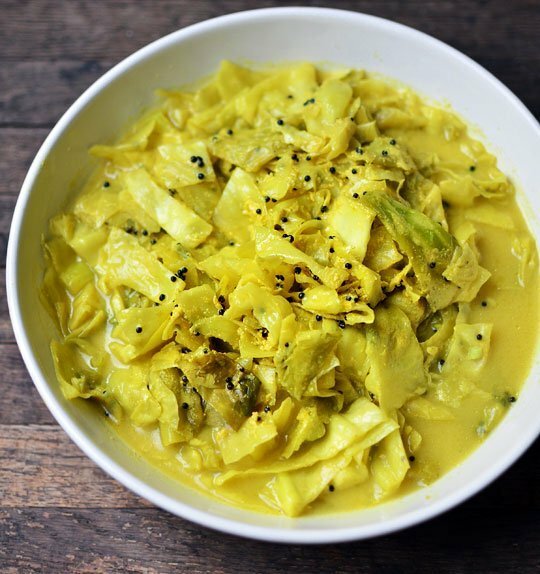 These culinary delights are just the tip of the iceberg when it comes to cooking with a seemingly plain head of cabbage; hopefully these recipes inspire you to do your own exploration with cabbage in the kitchen that you can share with us online or at a market! What is Your Culture of Food? At Colchester Farm CSA we have had a lot of opportunities recently to think about food. This might sound silly, considering our daily labor out in the fields to produce the makings of good food, but we have been involved with many events this spring, most notably the wonderful talks given at Washington College as part of the Recipes for Change lecture series put on by anthropology professor Bill Schindler. This series ran through a vast diversity of idea about the culture of food, from the hunter/gatherer diets of our distant ancestors to food marketing and school lunch programs. 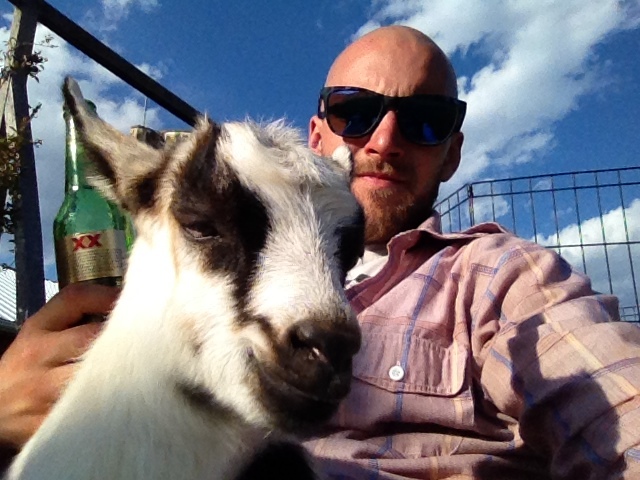 The series just ended last week with a talk by the inspiring urban farmer, Will Allen. Going to these talks and discussing issues of food afterwards has prompted us to better examine our local food system; where does our food come from, what are we eating and is it nurturing us? The first question we have to ask ourselves though is why we should bother to think about food so much. The answer goes far beyond the concerns of health and safety in the production and consumption of food (which are great); we must remember that when we are talking about food and it’s preparation we are talking about a vital part of our daily lives, something we must engage in every day. It should come as no surprise that such an essential part of life could be found rooted deeply within culture, science and art. The art of cuisine is a very serious tradition that all cultures uphold, because food is one of the primary ways that a people can distinguish themselves. A cultures food can tell you about their customs, beliefs, geography and aesthetic. Throughout human history food has been an effective way to bond people together; it is a powerfully symbolic act to share food (nourishment) with someone. The sharing of recipes can be an intimate way to pass on personal and cultural knowledge from one generation to the next. Because of the great importance of food in culture and health, a great deal of time has been invested, through science and technology, into the study, production and sale of food. The “food industry” encapsulates every part of the production, transport, and sale of food all around the world. Such a vast system includes the efforts of such diverse fields as agriculture, bioengineering, chemical manufacturing, mechanical engineering, economics, marketing, transportation logistics, nutritionists and other medical professionals, educators, politicians and lobbyists…the list goes on and on. So we can see now that food is a very important topic, one that affects all people in many different ways, and is therefore worth our attention. The next question is what is there to talk about? What do we understand about the food we eat and is there anything that needs to be changed? You can learn a lot about someone by learning about what they eat regularly. Many times the fastest way to learn about a person from their diet is to look at what they don’t eat. Do they have reasons of personal taste and cultural appetite? Is it a medical reason like an allergy? Or is it a moralistic or social statement like the refusal to eat meat to protest the treatment of animals? We say a lot about ourselves with what we choose to eat, and in this modern, technologic age of global economics and genetic engineering we seem to have more and more opportunities to make crucial statements through our food choices. Practices like genetically modified organisms (GMOs), globalization of markets and monoculture production, combined with poor political action and the placement of profit over health, have created a worldwide food system that has not succeeded in meeting the food and nutritional needs of so many around the world, while simultaneously degrading the rest of the environment. Though it may seem small, uneventful, and passive, the fight against these dangerous practices is being fought every day by you and I. We have the power to choose if we want these damaging practices to persist, because we are the ones who buy the food products. There are many more things we can do to actively create and support a safe, local, transparent culture of food in our area, but the ultimate fight will be won with every small victory of deciding to buy products based not on your wants and desires, but on taking a few steps back to see the needs of your local economy/community/ecosystem and potentially going out of your way to support a product and/or solution that you see having lasting, beneficial effects on your health and the health of those around you. What would we keep worms for? It’s not their meat… it’s their poop, which people who practice vermiculture (the cultivation of worms) have given the less crass name of “worm castings”. Ok so you know that we keep the worms for their “castings”, but why on Earth would we do that? Though their slow movement and simple appearance might cause people to easily overlook or even avoid them, earthworms (like red wigglers) play a crucial part in our lives; they are one of the primary species that create and sustain the living soils that we are dependent on. Like all organisms, worms manipulate and change their environment; they burrow through the ground, making tunnels that can form complex systems running throughout the soil in all directions. These tunnels are important in that they allow for water and chemicals in the air like oxygen to be accessed by plants and other organisms that live in the soil. Also, as earthworms travel through the ground they eat soil particles and organic matter (decaying plant and animal matter) as well as tiny soil particles like grains of sand. As all of these materials travel through the worms digestive system, they are broken down into smaller, simpler, compounds and nutrients and deposited in the form of a “cast”. These casting are small bits of soil that have high concentrations of nutrients that in turn fertilize plants and feed other organisms. By constantly eating and moving through tunnels, worms are circulating soil and nutrients throughout the Earth non-stop, 24/7. Having worms in your garden soil is an easy and wonderful indication of healthy soils; where worms can be sustained there will be moist, nutrient rich soils which sustain all other plants and animals. The more earthworms you have the more worm castings they are producing that will better fertilize your soil and sustain a healthy soil ecosystem. Worm castings are a boon to farmers looking to sustain plant crops on the same soil year after year, and it’s no surprise that people have started trying to take greater advantage of this phenomenal organism. Vermiculture, or vermicompost, is the process of composting material specifically using different types of worms to create a highly homogenous, nutrient rich organic fertilizer. Composting, the process of utilizing decomposition to break down organic matter into rich soil material known as humus, has been practiced here at Colchester Farm CSA for years. But vermiculture gives us the opportunity to use worms to make decomposed soil humus faster, and have it contain higher concentrations of nutrients. We have worms in our compost piles but, the pile being just a pile, the worms can come and go as they please. What we have done is create a contained space in which to hold the worms, commonly referred to as a worm bin. There are as many variations on vermicomposting as there are any other type of agriculture, so here we only will discuss the practices and procedures we know and use at Colchester. Having said that, vermiculture is new for us here and we are treating it as a research project until we can learn more from experience and better care for and use the worms. Laying down the wire netting floor that will hold in our worms and keep out mice. 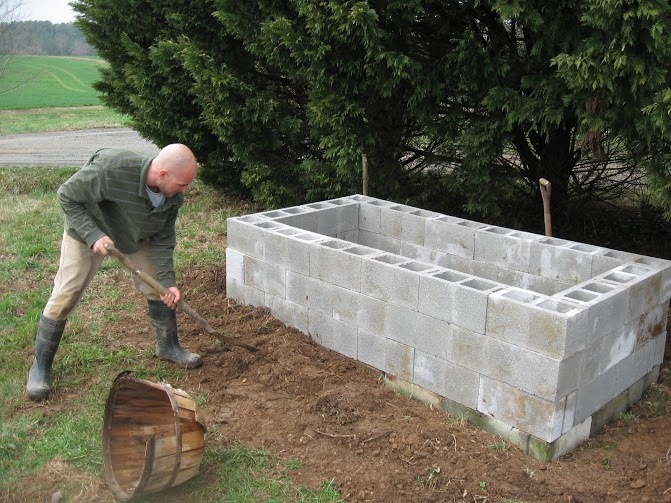 We built a worm bin out of cinder blocks to house our new workers. We wanted an open bottom exposed to the soil so that proper flow of air, nutrients and water could occur, but we didn’t want the worms we put in the bin to be able to escape the bin. We need to keep the worms contained in order to harvest their castings, so we laid down a small mesh wire netting as the floor of our bin. A removable screen insert allows us to create two different piles to work with without preventing the worms from traveling between the two piles. This will help us to determine when one pile is totally decomposed and ready for use (as the worms will run out of food and migrate out of this pile into the other). We will begin with ~5 lbs. of earthworms in our bin, which were bought from a supplier. In trying to create a home for the worms that contains ready made soil and new food sources, we will be creating a mixture of soil, compost, and food/veggie scraps to welcome the worms to their new home. Once they acclimate we will feed the pile with regular plant waste to ensure the worms have a regular source of food to digest and process. Keifer, a seasonal apprentice, puts the finishing touches on the bin. This is an exciting new project to start with the seasonal apprentices, who moved in just a few weeks ago. A big part of their experience on the farm is to learn about and experiment with different ideas and strategies that could someday help them in future farms or other agricultural operations they will be involved with. 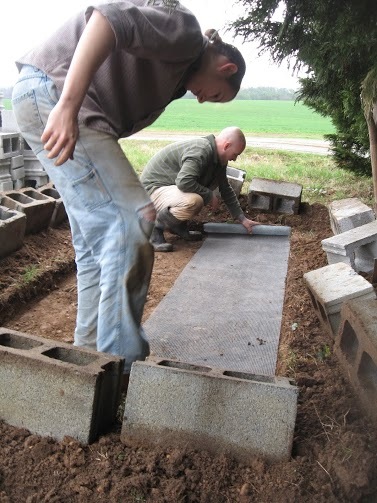 They can help plan and maintain this home for earthworms we have constructed, and because it’s new for us too, we can all learn it together. Right now, we see vermiculture as a unique, low-maintenance way to improve and diversify our farming operation. We look forward to learning much more about it and reaping the benefits of worm poop!